So, even though I only saw 21 films in February, I saw such a wide variety and so many interesting films it was really hard to narrow it down to a few to highlight. One major thing I will say: freaking avoid Fifty Shades of Grey at all costs. Even if you’re “curious,” DON’T BE. It’s trash and not in the John Waters sense. It’s horrid. Save yourself time and money. Anyways, these five films are all delightful and well worth your time and money. I understand this film went through a very long production history and that lots of Frida Kahlo enthusiasts have problems with it, but as someone who only really knows her paintings (I saw them once at the S.F. MOMA), this movie was fantastic. Salma Hayek was brilliant as Frida, and received a well-deserved Oscar nomination for her performance. I love Taymor’s aesthetic. Her films are like moving mixed-media art pieces and I really, really dig that. I’m calling this a 2015 film because that’s its U.S. release year (deal with it). I’ve actually not seen Céline Sciamma’s other two films (Water Lilies and Tomboy), though I intend to this year. This film loses steam a bit by the end (although the very last shot is perfection), but it contains some of the most realistic insight into being a teenaged girl (interacting with other students, teachers, friends, siblings, parents) that I’ve ever seen. 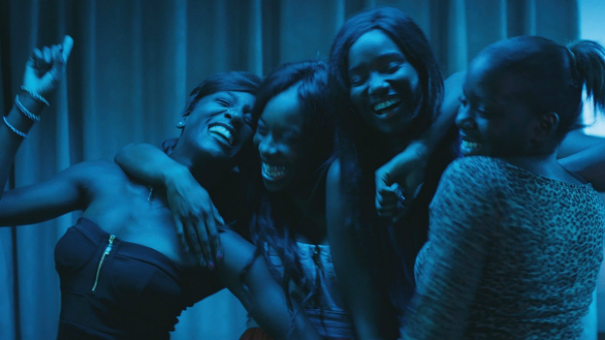 Watch the scene where all the girls dance to Rihanna’s Diamonds and don’t tear up a little, I dare you! I remember when this movie came out, it was my second summer in San Francisco when I was in grad school and I had just started working at a few movie theaters, so I didn’t have as much time to see movies (oh, the irony!) and I missed a whole lot of things, this included. But I’m kind of glad I saw it now, because I think I wouldn’t have appreciated it as much then as I did. It’s a lot darker than I expected it to be (the trailers make it look waaaaaay more upbeat than it is), but it’s not depressing at all. Basically, it’s a pitch black end of the world rom-com and it really, really works. That last 10 minutes or so of the film will hit you like a two-ton truck and you’ll cry a lot (or at least, I cried a lot). I think about this movie a lot. Of all the movies I watched last month, this one really struck a chord with me and I’m tearing up a little just thinking about it right now. So good. Everyone has gone on a variation of this family vacation from Hell. This movie is from Uruguay (with some Mexican funding I believe) and it’s mostly about a 13 year-old girl who is stuck on a vacation with her estranged father and young brother – and it rains through 99% of the movie. Adolescent angst and shenanigans ensue. As do some very tender moments between the girl and her father and the brother. It’s a great film. Roger Ebert called this the 3rd best film from the 00s, but if you look at its user ratings pretty much anywhere you would think it was just average. I dunno what’s wrong with people, because I’m on Ebert’s side. This movie is a masterpiece. I’ve rarely seen a film with so much empathy for its characters. Charlize Theron, who won an Oscar for her performance in this film, becomes this character – from the way she walks, to the way she holds her hands, to her facial expressions. It’s a brilliant performance. This film also contains one of the most tender romances I’ve ever seen in a film, which I was not expecting since it is a biopic of a serial killer. I mean, who knew? So that was February. I’m looking forward to even more wonderful discoveries in March (and so many great films coming out in theaters!) If you want to know what I think about every film I watch subscribe to my YouTube channel here. I hope you have a great March, and remember: seek out movies written and directed by women! Your money talks! Help female creators at the box office and we’ll get more movies by and for women made! Posted on March 1, 2015, in 2015 in Films and tagged A Year With Women, Bande de filles, Frida, Girlhood, Monster, Seeking a Friend for the End of the World, So Much Water, Tanta agua. Bookmark the permalink. 2 Comments. I love the idea for this series. Thanks for the film recommendations! Seeking A Friend For The End Of The World was quite a little gem. I really enjoyed it & I don’t think it gets its due for how charming & sweet it is. It has one of my favorite things good movies have: heart.